The Belize Police Department are investigating two murders and a non-fatal shooting that took place only hours apart last night. Just before 6:30 p.m. police found 30-year-old Victor Mason Gibbs, dead behind the wheel of his SUV, which was parked in the middle of the Street at the corner of King Street and West Canal. Police say the engine was still running when they found him and that he had gunshot wounds to the back of his left ear, to his left cheek, to the left shoulder, to the right cheek. By 3 a.m. on Saturday police responded to another report, to find 26-year-old Kendis Flowers dead on Mahogany Street. Officers say he was found about 100 feet from Sittee Street with a gunshot wound to the eye. The also found a pistol with one live round on him. Moments later police went to the Karl Heusner Memorial Hosptial where the found MaliekPitts with a gunshot wound to his left calf and another to his right leg. Police have since detained him pending an investigation. The department said that it is trying to ascertain whether or not Pitts’ injuries are connected to the shooting death of Kendis Flowers. The Government of Belize is taking several steps in the short term to address the upsurge of violent crime that plagued Belize City over the weekend. 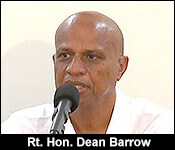 At a press conference today, Prime Minister Dean Barrow outlined the immediate strategies being employed to counter the current state of affairs in the city, which has seen five people dead and one more injured. Barrow said that he will be rejoining the Ministry of Defence and Ministry of Home Affairs back into the singular Ministry of National Security. That ministry will again be headed by John Saldivar. 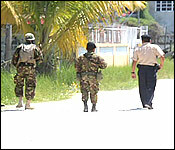 The strategy also includes bringing in Belize Defence Force soldiers to assist in Patrols in Belize City. Barrow also said that government will be approaching the Governor General, Sir Colville Young, for him to sign a declaration demarcating specific areas within Belize City as “Emergency Areas” as prescribed under Section 18 of the Constitution of Belize. Under the provision, security forces will be empowered to detain criminal elements in those particular areas for longer than the usual 48 hours as part of an effort to contain any retaliatory violence and other criminal activity. Barrow stressed that solving Belize City’s crime problem will require a “holistic approach” but that the measures are being implemented to address the immediate need for public safety. He said that GOB will continue to work to find a more suitable long-term solution. 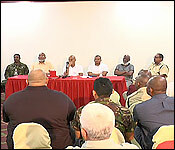 Cabinet is holding an emergency meeting today, while Belize Defense Force soldiers have been deployed to Belize City, after a night of violence left four people dead and two more injured from gunshots. There were shootings on Gibnut Street, Tibruce Street and Naragusta Street. Two women died as a result of the shootings, one of them as 62 years old. 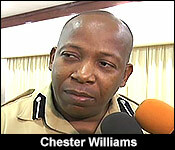 In one of the incidents, the shooter opened fire on police officers. Sources tell The Reporter that the incidents are a part of an escalating gang war in the city, triggered by the Saturday morning shooting of 25-year-old Kendis Flowers. 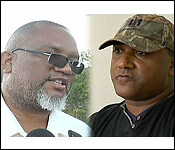 The Belize Police Department said that it is employing strategies to neutralize the situation. Prime Minister of Belize Rt. Hon. Dean Barrow and Ministers of Home Affairs and Defence, and Heads of the Security Forces Press Conference to discuss the way forward in light of the present high security alert in Belize City. The weekend, Belize City reeled into panic after a spree of gun violence so lawless - that it forced Cabinet to meet in an emergency session on Sunday. Coming out of that meeting, there were major changes in the security apparatus, and the Ministry in charge of the security forces. "Let me begin by expressing government's shock and anger and rage at what has happened." What happened was a 26 hour span that saw 5 murders on the Southside. "There is a need to do something now!" "The Belize Defence Force will be asked, was asked last night and will be asked on a continuing basis to assist the Belize police department with the ongoing campaign." "This will mean that there will be more boots on the ground and that more effective coverage can be deployed as a way of trying to contain and in fact prevent some of what has been taking place." "It is necessary, it makes sense for us to reconstitute one umbrella ministry of national security, with one national security ministry now there can only be one national security minister and that Minster will be the Honorable John Saldivar." "The sort of effort at guilt by association that arose with respect to Minister Saldivar in the context of the mason case, I think has been spent. There has emerged absolutely no evidence of any kind of relationship that was improper between Minister Saldivar and the now infamous or notorious Mr. Mason." "We will under section 18 of the Constitution of Belize ask the Governor General to designate certain clearly demarcated areas on the southside of Belize City as emergency areas." "The purpose and intent of those regulation clearly, will be to assist the security forces, in particular in their ability to remove from the theater of operations as it were, even if only temporarily, players that are known by the police to be leaders of Murder Inc."
"But we believe that we will be able to go beyond just that 48 hours in terms of immobilizing those that we feel need to be taken off the streets at a particularly juncture and for a particular period to, in fact, stanch, resist any upsurge in criminal violence and in murder." "It cannot be just a policy of, or a policy at all of brute force and ignorance. There has to be an effort made to restore trust between the Belize Police Department and the neighborhoods, and the citizens they serve, and, together, with hard policing, the intervention exercises must continue, efforts at conciliation must continue, a serious attempt must be made to win hearts and minds." "I am confident that with those measures announced by the Prime Minister today, that we will be able to arrest the situation and arrest it very quickly. There is no time for procrastination. There is no time for complaining. There is a time for action and we must put our best foot forward."